*Warning to non-meat eaters: this post includes stories and images about beef, chicken, and lamb. Dark chocolate and salt appear, too. 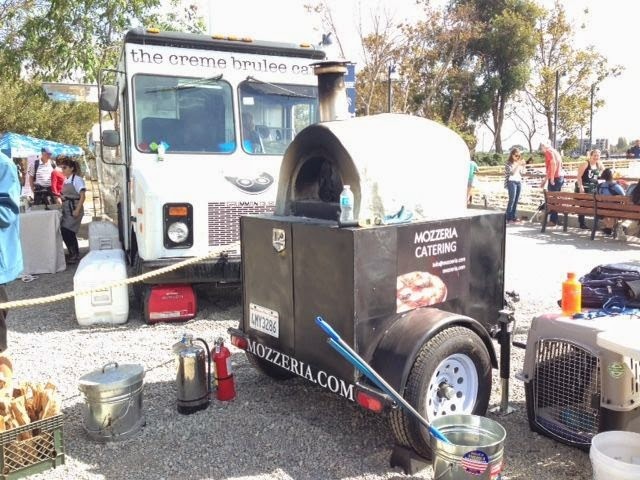 A school bus-yellow forklift hummed through the crowd at last Saturday’s Eat Real Fest at Jack London Square in Oakland, CA. People veered to the left or right, like an opening stage curtain. 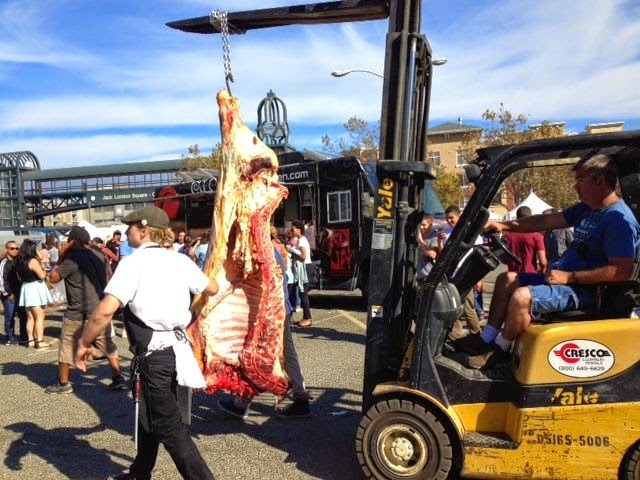 “Stand back, folks,” called two guys, one on each side of half of the carcass of a butchered cow swinging from an S-hook on the forklift’s overhead bar. 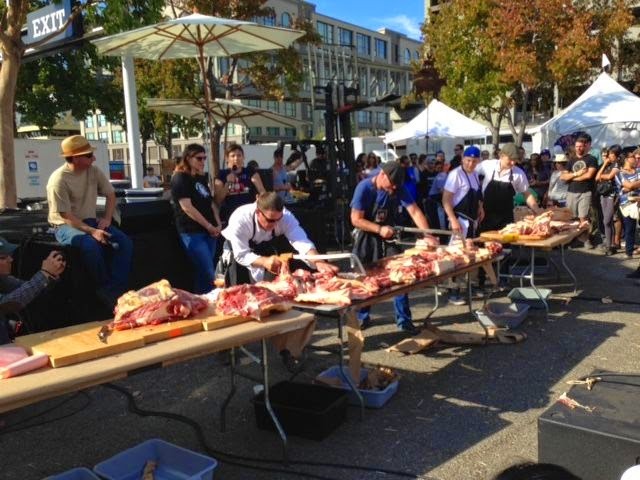 Bystanders’ mouths dropped open as they reached for their phones, snapped photos, and followed the procession to a butchering demonstration at one of the Festival’s stages. Sweat trickled down my back in the afternoon heat as I joined the throng. As the carcass coursed through the foodie crowd, comments such as “Wow, beautiful!” outnumbered the few, “Eww, gross!” reactions. 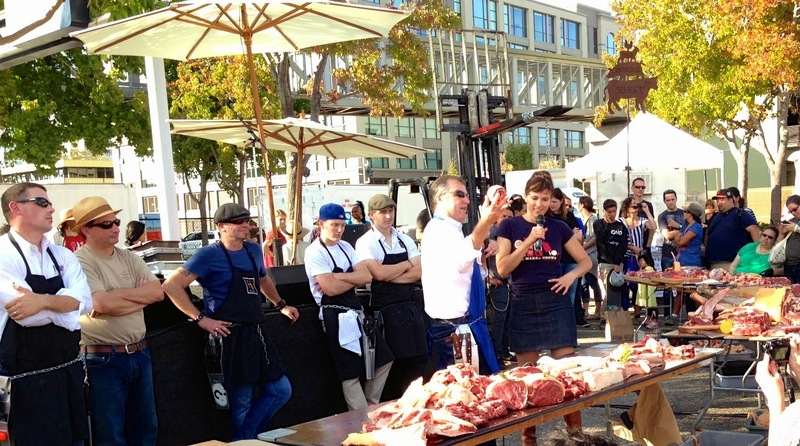 Four teams of award-winning butchers awaited the arrival of the half of beef at the festival’s makeshift butcher shop. 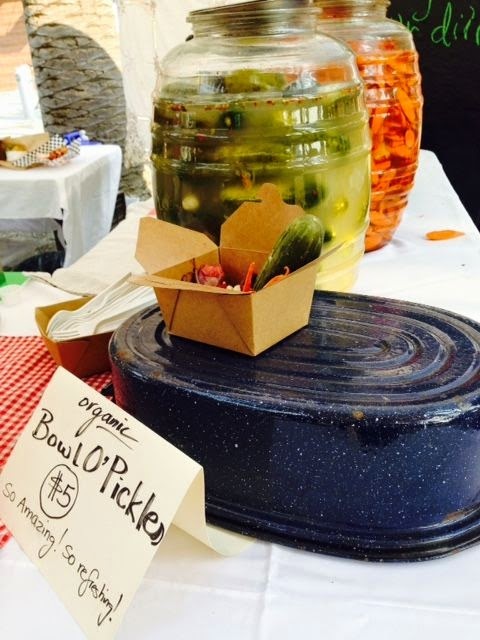 Fifty or so festival-goers perched on hay bales as Eat Real Festival founder Anya Fernald gave some background on this event, now in its sixth year. 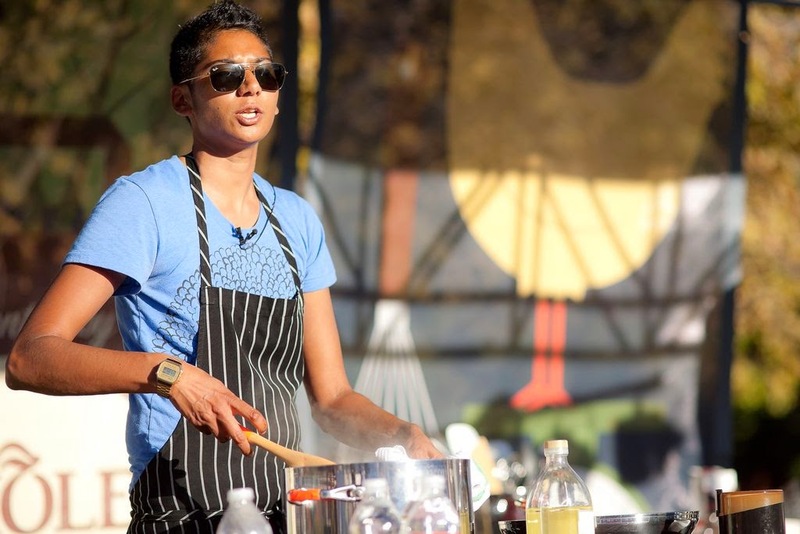 Eat Real, a three-day festival of “food-centric fun and epicurious education,” brings together seventy-plus Bay area food-makers to focus on food craft, street food, artisan beers, local wines, and food choices that feature sustainable, local ingredients. 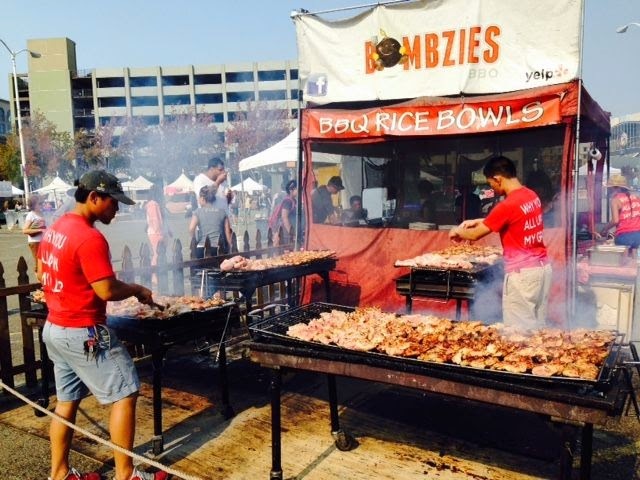 There’s no admission fee for the almost 200,000 people who attend the festival, and vendors charge no more than $8 for the foods they serve (many items cost $5 or less, and free samples were abundant). The festival was founded by a group of people with a social change agenda to promote delicious, convenient, affordable, and sustainable food. In addition, 100% of the festival’s profits go to the Food Craft Institute (FCI), a non-profit educational institution, also started by Anya. FCI combines classroom and hands-on teaching of traditional food-making techniques that date back centuries, alongside contemporary entrepreneurship, to create viable food-related businesses. 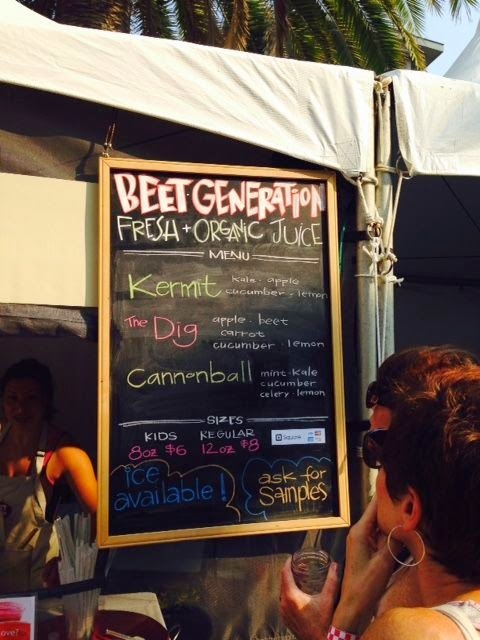 I first learned about the festival from my daughter, who works for Anya at her other food venture, Belcampo, a farm-to-fork organic meat production company (read about our visit to the farm in my August 25 post, “Vacation Time”). Belcampo provided the grass-fed beef for the Eat Real butchery demonstration, and more than one of the butchers praised the meat’s quality and its high level of marbling (those bits of fat that add so much to the flavor). 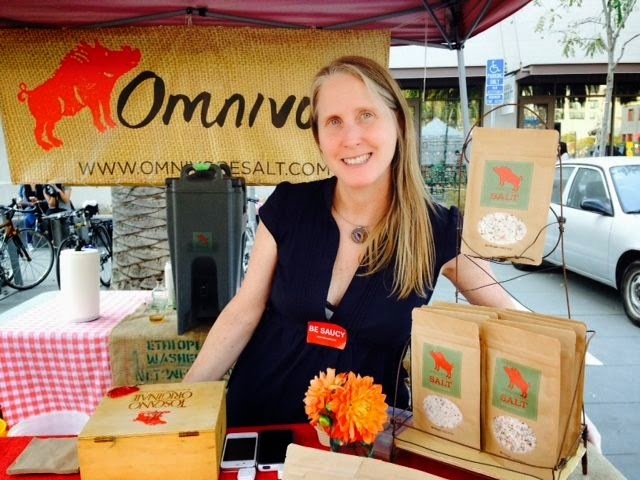 I’m an enthusiastic omnivore, and I’ve learned a lot in recent years about the downside of the U.S. food industry as well as efforts to improve it, so I was delighted to attend this celebration of good food. But, the festival isn’t all about meat (though there was plenty of that, including lamb gyros and grilled chicken). 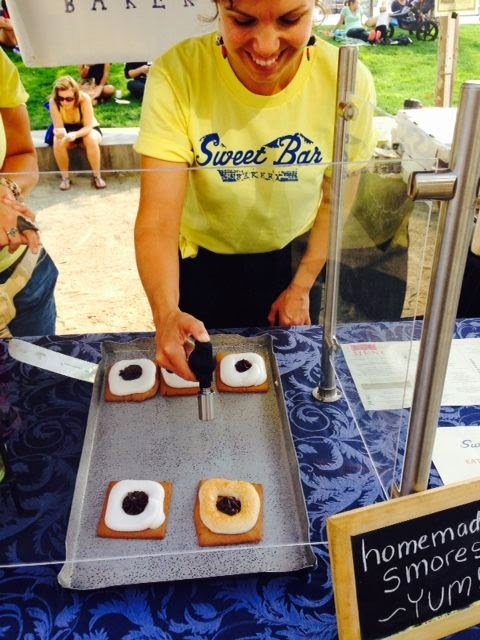 The first stop on my tour among the food trucks and tents was at Sweet Bar Bakery. Who could pass up S’mores on home-made graham crackers with dark chocolate ganache, surrounded by marshmallow crème (carmelized before my eyes with a mini-blow torch)? Cooking demonstrations broke up the eating, and I picked up some tips about making soup from scratch (good stock and fresh veggies are key) and Indian curries. Chef Preeti Mistry of Juhu Beach Club advised roasting spices that may have been languishing on the spice rack to bring out their flavors; she also whipped up a mouth-tingling curry of chicken thighs, kale, onion, and jasmine rice (more free samples). (visit the company’s website for a charming food story about owner Angelo Carro and the recipe he learned from his grandmother during his boyhood in Sicily). I bought a small pack of the salt and was happy, though skeptical, when the vender (photo) told me the company recently shipped some packages to Lopez Island. 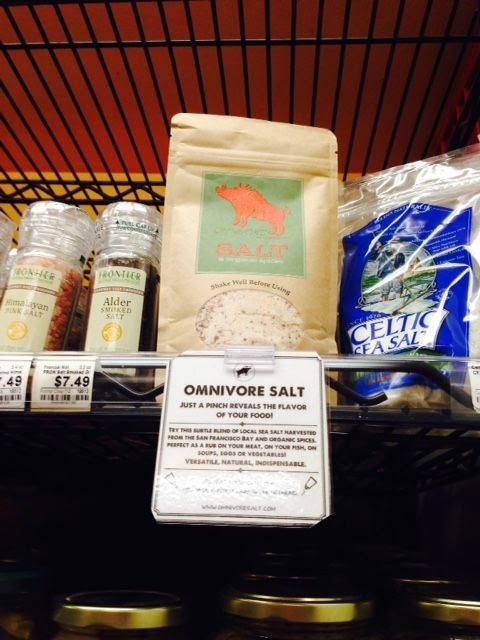 Sure enough, earlier this week when I went to Blossom Grocery, Omnivore Salt was on the shelf. Blossom co-owner, Brian Kvistad, confirmed the story I’d heard at Eat Real that the company persevered through shipping challenges to get their product to our community’s small natural foods store. Wondering what happened at the butchering demonstration? In the afternoon sun, the butchers wielded knives and hand saws (“cross-fit with half a beef,” Anya said), pausing occasionally to wipe sweat from their foreheads and to slide knife blades on the sharpening rods they all wore in the belts around their waists. Anya’s questions about the characteristics of the various cuts led the butchers to explain flavors and cooking techniques, the kind of consumer education they all provide in their respective butcher shops. And for the Eat Real crowd, a few lessons in how using the whole animal adds to the viability of organic meat production. Over the course of an hour, that half beef became roasts, steaks, ribs, bone marrow, and flank steak. Doesn’t get much more real than that.